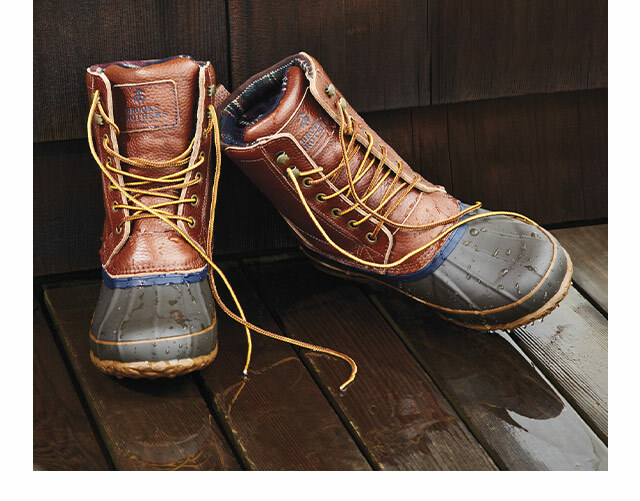 Have the last quack: Our Duck Boots are still in stock! **40%-off offer is valid on one full-price item 12/10/18 – 12/16/18 in U.S. and Canadian Brooks Brothers Retail stores only; not valid online, by phone or in Factory stores. Please present this savings certificate at time of purchase; one per customer, for one-time use only. 25%-off offer is valid 12/10/18 – 12/16/18 until 11:59 p.m. ET online and by phone, and until the close of regular business hours in U.S. and Canadian Brooks Brothers Retail stores; not valid in Factory stores. Visit brooksbrothers.com/stores for store listings. Excludes shipments to certain countries; see brooksbrothers.com/borderfree for a list of excluded countries. Offers cannot be combined with each other or with any other discount or offer. Not valid on Red Fleece and Golden Fleece merchandise, charitable items, and made to measure and special order clothing purchases, and applies to select accessories and select Brooks Brothers shoe styles only. Discount may not be applied toward taxes, shipping and handling, monogramming and engraving, alterations or personalization. Not valid on previous purchases or on the purchase of gift cards. If you return some or all merchandise, the dollar value of this promotion is not refunded or credited back to your account. No cash value except where prohibited, then the cash value is 1/100 cent. Items purchased during this private sale will not be subject to a price adjustment. ***Triple Points offer valid 12/10/18 – 12/23/18 until 11:59 p.m. ET online and by phone, and until the close of regular business hours in U.S. Brooks Brothers stores. See the My Brooks Rewards Terms for additional details regarding earning points and Rewards. † Offer valid online only from 3:00 a.m. Eastern Time December 3, 2018, through 3:00 a.m. Eastern Time December 26, 2018. Buy a single Brooks Brothers eGift Card in the amount of $150 or greater and receive a $25 Reward eGift Card that can be applied toward the purchase of Brooks Brothers merchandise. Limit five (5) Reward eGift Cards earned when purchasing $150+ eGift Card(s). Offer only applies to a single eGift Card purchased at $150 or higher; does not apply to a single transaction of $150 on multiple cards. If payment for purchased eGift Cards is returned or canceled for any reason, then all Reward eGift Cards provided in connection with the transaction will be voided. Reward eGift Cards are issued for promotional purposes only when eGift Cards of a sufficient value are purchased, cannot be redeemed for cash, and may not be transferred or assigned in any manner to any other individual or entity. Brooks Brothers reserves the right to suspend the offer at any time during the Offer Period. 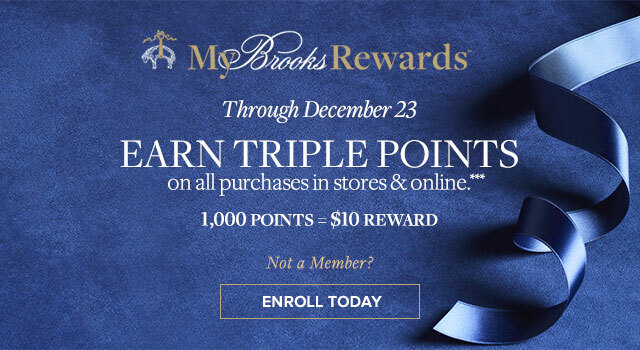 All eGift Cards issued pursuant to this offer (including all Reward eGift Cards) are subject to the eGift Card Terms and Conditions appearing on CashStar's website at: https://brooksbrothers.cashstar.com/about/terms_and_conditions/. †† Buy a single Brooks Brothers Gift Card in the amount of $150 or greater from 12/3/18 to 12/24/18 and receive a $25 Bonus Card that can be applied toward a merchandise purchase from 12/26/18 to 1/31/19 in U.S. and Canadian Brooks Brothers Retail and Factory stores; may not be redeemed online, by phone or in Airport Stores. If your purchase is less than $25, you forfeit the balance of the Bonus Card. Limit five (5) Bonus Cards per customer, per transaction, for one-time use only. Offer applies to a single Gift Card purchased at $150 or greater; does not apply to a single transaction of $150 on multiple cards. If payment for purchased Gift Card is returned or canceled for any reason, then promotional Bonus Card provided in connection with the transaction will be voided. May not be applied toward taxes or shipping and handling. Not valid on previous purchases. Bonus Card cannot be redeemed for cash or applied as payment to your Brooks Brothers credit card. Brooks Brothers reserves the right to suspend the offer at any time.